« Does Jeb Bush’s Support for Higher Taxes Make Him more Fiscally Conservative than Paul Ryan? 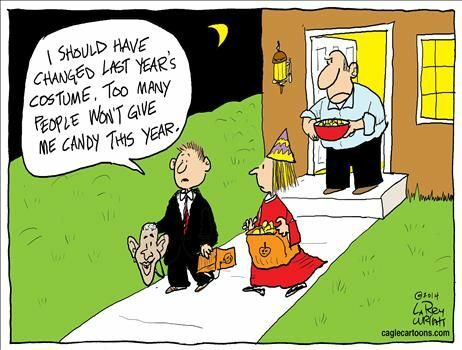 It’s time to extend the tradition of sharing politics-related Halloween humor on October 31. Though this is only my fourth year, so maybe it’s not quite a tradition yet. Nonetheless, we’ve had some good material. 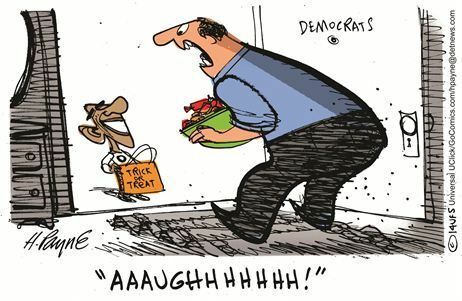 There were two Halloween posts in 2011, including a cartoon about what happens when kids trick-or-treat at a statist’s house, as well as a comic’s very clever and amusing analysis of taxes and Halloween. 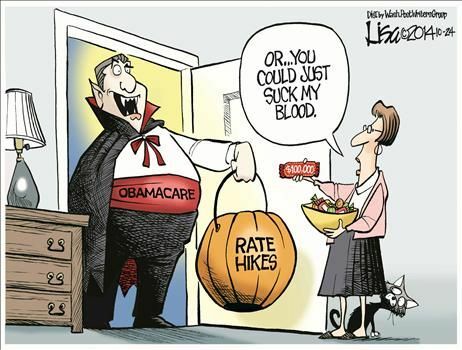 In 2012, I shared several Halloween-themed cartoons, mostly about Obama’s spendaholic tendencies. 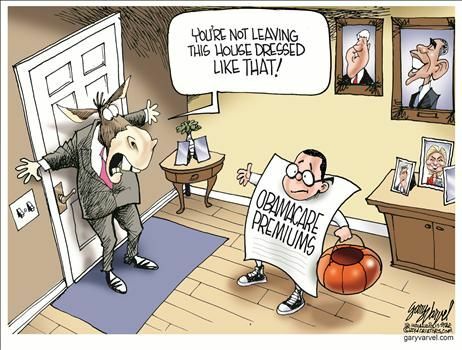 Last year, Obamacare was the unifying theme in the cartoons I shared. This year, we have six more political cartoons. The first bunch focuses on scary political figures. We’ll start with a cartoon from Henry Payne, who suggests that Democrats are the ones who are most fearful of Obama. Larry Wright, meanwhile, warns children that some costumes won’t produce much candy. 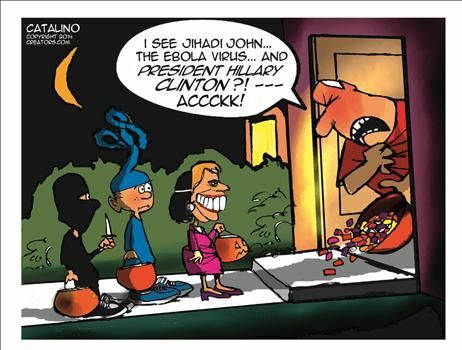 But Obama isn’t the only hobgoblin scaring people. Here’s Hillary Clinton, courtesy of Ken Catalino. 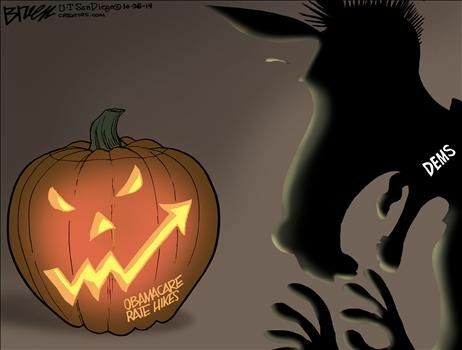 The following Halloween cartoons all share a common theme, which is that Obamacare is generating much higher prices for health insurance. Here’s Steve Breen’s contribution. Democrats are scared, to be sure, but consumers are the real victims. Lisa Benson weighs in. I particularly like the candy bar in the cartoon. Last but not least, Gary Varvel has a similarly amusing perspective. Thought there is a serious point to make about this last cartoon. The White House appears to be hiding some of the negative effects of Obamacare until after the election. Here’s some of what the U.K.-based Daily Mail has reported. The open enrollment period for federal Obamacare plans will begin more than a month later than it did last year, with this year’s start date coming after the midterm elections. …the White House and the Department of Health and Human Services have said politics aren’t at play. …Still, the move has the added convenience of allowing insurers to keep next year’s rates a secret until voters have already cast their ballots for or against Democrats who voted for or support the health care law. Gee, that’s convenient…if you’re a Democratic political operative. Not surprisingly, some folks are skeptical. For what it’s worth, I share these concerns. By arbitrarily deciding what parts of Obamacare to enforce and when to enforce them, the White House already has made a mockery of the rule of law. So what’s another politically motivated change in the rules, a la Argentina? P.S. Now let’s shift to the elections. 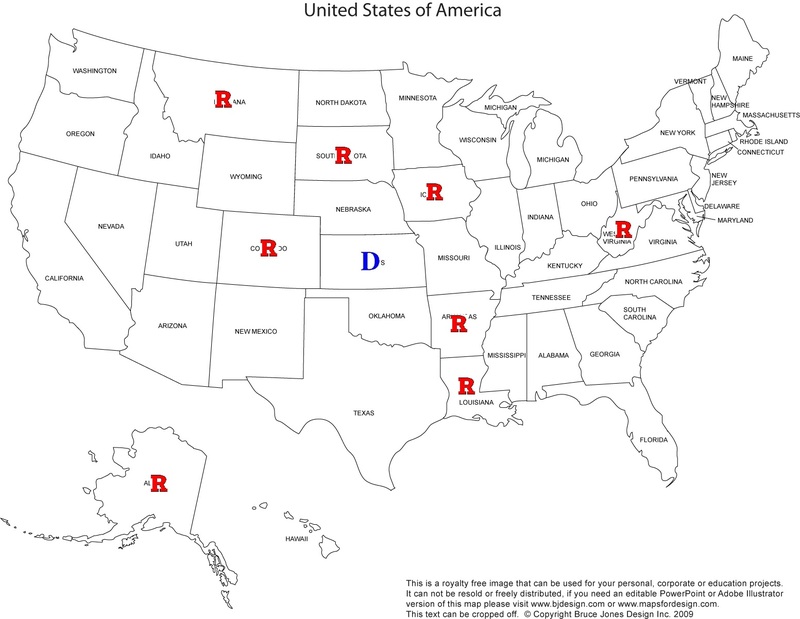 A few days ago, I made my initial projections for the House and Senate elections that will take place on Tuesday. I predicted that Republicans would control the Senate 52-48 and the House 246-189. Having looked over some of the polling data, I’m going to stick with my Senate prediction. Though I’ve made a change. I still think the GOP will win the same 8 seats that I projected last time, but now I’m predicting that Republicans will hold on to their seat in Georgia while losing a seat they hold in Kansas. So still a net gain of 7 seats for the GOP. Here are the Senate seats that will change hands. I also admitted last time that I’m not overly confident in my predictions and that the final outcome could be anywhere between 52-48 Democrat control and 55-45 Republican control. In other words, I thought there were a bunch of races that could go in either direction. For what it’s worth, I think the trend is against the Democrats, so I’ll now predict that the final results will be somewhere between a 50-50 split (in which case Biden casts the tie-breaking vote) and 56-44 GOP control. In the House of Representatives, the pro-Republican trend leads me to predict the GOP ultimately will have 248-187 control, which would be the most Republicans since 1930. P.P.S. Just as I warned last time, don’t hold your breath waiting for big changes in policy if the GOP winds up in control of both chambers of Congress. Even assuming they want to do the right thing, Republicans won’t have the votes to override presidential vetoes. So there won’t be any tax reform and there won’t be any entitlement reform. Please explain to me (as a non-US resident) whether Obama’s toxic influence on democratic candidates is more acute than previous second term presidents (I believe Bush had a similar effect)? … you see now why the road to serfdom, lower motivation, loss of competitiveness and decline is a one way street? terrorists purchase several million in illegal drugs on the black market… contaminate the drugs with a weapon’s grade biological agent… with a long incubation period… distribute the contaminated drugs throughout north America using the Mexican drug cartel’s distribution network… in a matter of days… junkies which have injected the drugs…. spread the disease throughout north America… pandemic… the medical system collapses… panic ensues… and we have the much touted zombie apocalypse…. scary………. but not to worry…….. it’s only a story…………………………………..